An important churning is taking place in India today. The contemporary Indian mind, which for the most part had until now, almost completely dismissed the possibility that the ancient Indian civilisation had anything to offer for the modern world, is making an attempt to re-discover the spirit of Indian civilisation, the soul of India. Such churning may lead to a fair view of our heritage, a rational assessment of our past glory and failures, and perhaps also some misplaced chauvinistic pride. There is also a greater risk of cultural pride becoming the means to a regressive thinking about trying to imitate the past without a comprehensive understanding of the present challenges and future needs of the nation and the world. Such an approach would disregard the truth that past can only be a foundation on which the future structure has to be built. One of the questions that is emerging as a result of this churning is: how to Indian-ize our education system? Can it be done by bringing more of India into the curriculum, or more of Indian approaches to knowing, learning, human development? Or more fundamentally, what does it mean to Indian-ize our education? How can Indian spirit be more meaningfully integrated into the educational experience of our children and youth? Or perhaps, to begin with – what is meant by the Indian spirit? In this essay I address some of these questions in the light of some of the writings of the Mother and Sri Aurobindo on topics related to Integral Education, National Education and Indian culture. Some practical implications from the analysis are also presented for readers’ consideration. An India-centric philosophy or conception of education must be based on a deep and conscious awareness of Indian conception of human being, aim of human life, aim of education. So, let us begin there. There are many serious concerns and problems in our present education system, and many of them are in some way inter-connected. But one of the most serious flaws, something really fundamental, perhaps the root cause for many other problems, is this – our present approach to education is largely based on an industrial-rational-materialistic view of individual, life, and society. Because of this guiding view, education has ended up only as a means for social success, a doorway to socio-economic upward mobility and a key to enter the hallowed chambers of ‘economic elite’ in the society. Education has been reduced to learning of certain skill sets and gather knowledge of certain content areas that can help secure learners’ economic and social futures. The mad rush to pursue a career-oriented education and only that, at whatever cost, is an indication. The high demand for private tutors, coaching centres for children as young as fifth-graders, clearly suggest that education has become like any other business. A good education must help learners become equipped with the right kind of training and preparation for a profession or vocation of their choice. But this has to be done in the larger framework of a much wider and deeper purpose of education. It is critically important that we move away from the prevailing industrial-rational-materialistic view and ground our educational approach in a more humane, holistic, Indian spiritual view which looks at individual first and foremost as a soul that is enwrapped in physical, emotional and mental sheaths. “Get a degree only for a job” kind of mentality must be done away with, if we want learners to grow in a more holistic and all-rounded manner. In order to do this, it becomes essential to know what is a human being in essence; what are the different parts or layers of a human being; how are these different parts – parts that must be developed – interconnected; and what is the most essential or ultimate aim of human life. India, according to Sri Aurobindo, has seen always in man, the individual a soul*, a portion of the Divinity enwrapped in mind and body, a conscious manifestation in Nature of the universal self and spirit. The phrase “enwrapped in mind and body” deserves a second look and a greater reflection. According to this view, the soul is the first and foremost truth of an individual being, and this soul expresses itself through the outer instruments of mind and body. Indian Education must be based on this conception of individual. Education, in this light, becomes the means to help prepare learners for a deeper transformation and inner evolution, which requires that all parts of their being – mental, emotional and physical – are properly prepared and developed to their fullest potential in order to manifest a harmonious and integral personality. In this light, education begins with the birth of the individual and continues throughout the life. Here we also see that education can never ignore its collective or social purpose which is closely inter-related to the individual existence. But the collective purpose is not only limited to the immediate society or nation, it extends to the whole humanity. This has great implications for curriculum planning, pedagogy and actual day-to-day teaching practice in classroom. A truly Integral Education should thus have three central aims – 1) for an individual, it is growth of the soul and its powers and possibilities, 2) for the nation, the preservation, strengthening and enrichment of the nation-soul and its Dharma, and 3) to raise both the individual and nation into powers of the life and ascending mind and soul of humanity. This highest object of human life must inspire the aim of a true and living Indian Education. Education must help create an awareness and facilitate an opening in the young minds and hearts for the fact that there is a personal inner truth, independent of and transcending all the layers of outer identity of the individual. And that the discovery of this inner truth through intense self-search and deep self-knowledge is the ultimate aim of human life. It is essential to understand that this is NOT religious education. We will come to this point a bit later. Seen in this light, all life becomes a means of education, in order for us to walk the path of discovering and realizing the aim of our life – individually and collectively. In order to make this a guiding inspiration behind all education in India, a total rethinking of our present model of education is essential. It will start only when those in the power to initiate such a rethink will intellectually accept the truth of the Indian view of human existence and aim of life. *Soul — I am familiar with the argument that the English word ‘soul’ does not really capture what is the imperishable and immortal Atman as spoken in Indian traditions (often translated as Self in English). But in Sri Aurobindo’s and Mother’s writings we find the usage of the word ‘soul’ to refer to what they define as the ‘evolving soul’, the ‘psychic being’ which is a projection of the unchangeable and eternal Self/Atman. It is also referred to as the spark of the Divine. Here are a few informative passages from some of the letters written by Sri Aurobindo where we get a clear description of psychic being, the true soul, and its relation with Atman/Self/Spirit. “The Spirit is the consciousness above mind, the Atman or Self, which is always in oneness with the Divine—a spiritual consciousness is one which is always in unity or at least in contact with the Divine. “The word “soul”, as also the word “psychic”, is used very vaguely and in many different senses in the English language. More often than not in ordinary parlance no clear distinction is made between mind and soul and often there is an even more serious confusion, for the vital being of desire—the false soul or desire-soul—is intended by the words “soul” and “psychic” and not the true soul, the psychic being. The psychic being is quite different from the mind or vital; it stands behind them where they meet in the heart. Its central place is there, but behind the heart rather than in the heart; for what men call usually the heart is the seat of emotion, and human emotions are mental vital impulses, not ordinarily psychic in their nature. This mostly secret power behind, other than the mind and the life-force, is the true soul, the psychic being in us. The power of the psychic, however, can act upon the mind and vital and body, purifying thought and perception and emotion (which then becomes psychic feeling) and sensation and action and everything else in us and preparing them to be divine movements. “The psychic being may be described in Indian language as the Purusha in the heart or the caitya puruṣa; but the inner or secret heart must be understood, hṛdaye guhāyām, not the outer vital-emotional centre. It is the true psychic entity (distinguished from the vital desire-mind)—the psyche. “The psychic is the soul, the divine spark animating matter and life and mind and as it grows it takes form and expresses itself through these three touching them to beauty and fineness—it works even before humanity in the lower creation leading it up towards the human, in humanity it works more freely though still under a mass of ignorance and weakness and coarseness and hardness leading it up towards the Divine. In Yoga it becomes conscious of its aim and turns inward to the Divine. It sees behind and above it—that is the difference. This is such a touchy subject. I face these problems everyday. Schools are confused and so are the kids. No wonder we have so many children who are drop outs. Yep, I am parent frustrated with the education system especially since we move cities every few years. I hear you, Inderpreet. I just wish the solutions were simple to the great number of problems that ail the system. And the saddest part is that no govt is ever interested to bring meaningful change of any kind. They just want to do more of the same stupidities that presently abound. O well….we can only hope that some light shines through small corners here and there. And thankfully that is happening, but the pace is slow and maybe that is necessary because any sustainable change/evolution is a slow and often painful process. 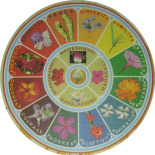 This entry was posted on January 23, 2018 by Beloo Mehra in Education, India and tagged Holistic Education, Indian Culture, Indian Renaissance, Spirituality in Life.